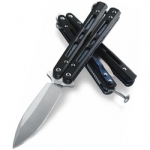 This is the standard that other Balisong knives are judged by for good reason. The superior quality of this knife must be seen to believe. Flips like a dream, cuts really well for a shallow grind and stays sharp for a long time. It isn't as hard to sharpen as S30V, but holds a really nice edge. Just don't get caught carying it - you will want to.